Are you frustrated because your house feels small or outdated? Maybe you have been searching for a new house but can’t find anything you truly love? Are you ready to sell your house but need to give it a makeover first? Whatever the reason, there are lots of options for updating and modifying a current home to make it fit your lifestyle and personal vision for how a home should look and feel. Many home remodeling projects begin because people simply need more space for a changing family or the current layout of the house doesn’t fit their needs. While some of these projects start as a renovation to one room, they can very easily spill into other parts of the house and eventually become a whole-house remodel. Older homes with small, closed-off rooms are opened up into large flowing spaces. Cabinets, appliances, and fixtures are updated to fit a customized design aesthetic. 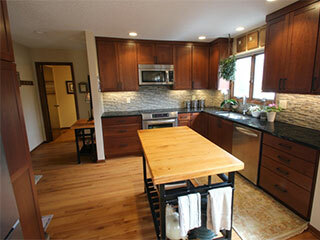 A whole-home remodeling project or renovation can be an extremely large and overwhelming venture. There are numerous decisions to make and lots of aspects to consider. Even the choice of how much of the home to remodel and the purpose for the renovation is a big decision. Despite all of these decisions, the important thing to remember is that remodeling is an investment. Any home improvements you make, no matter how extensive, should not only elevate the functionality of your house but should also increase your home’s value. And the best place to start is by making a plan. Like any large project, a whole-house remodel should not just begin because of a fleeting idea. There are too many facets to consider and choices to make to just start and then find you don’t like something or want to change your mind part-way into the project. Everything you want to improve or modify should be well thought-out, researched, and discussed. Below are some factors that should be included in the overall plan for your remodeling project. Have a vision – You may want to start by looking through magazines or visiting home improvement stores for ideas and inspiration. Everyone has their dreams and ideal things they want in a home. Before capitalizing on those dreams consider if they’ll work in the layout of the house, add to its function or even fit into the budget. It’s a good idea to prioritize the top 5 -10 must-haves before making a definite plan. Size – How much of the home are you willing to remodel? Are you going to renovate every room or just the kitchen and dining area? Are you willing to work with the square footage you already have or do you need to add on a room or a second story? If adding on is an option, you’ll need to check if permits are needed or if there are neighborhood covenants to consider. Of course all of these questions will depend on your budget. And there’s no reason you can’t have an extended plan to just do a portion of the house at a time. Style and Design – Everyone has a personal style and design they want in a home. Not only should you agree with the other decision makers in the family about this style, but you should also pick something that will stand the test of time. Don’t pick a style that is so trendy that you will need to update again in 3 years or get so customized with your lighting or built-in cabinets that it’s impossible to resell later. There are lots of styles to choose from including rustic, industrial, or modern to name a few and once you make a plan to use this style you’ll want to stick with it as it will influence the structure and materials you will choose as well. 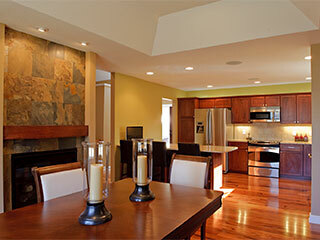 Budget – When it comes to a whole-house remodeling project the sky really is the limit. From the size to the design, the amount of demolition and rebuilding that will need to be done, the customization and luxuries that you want to add – all of this will influence your bottom line. So the big decision to make during your planning process is how much are you willing to spend? Once you set a budget and discover your dreams might be bigger than your pocket book you can always scale back or put off part of the project until another time. Many experts will tell you that you should also plan for a contingency of 10 to 20 percent of your budget to cover any unforeseen discoveries that are made during the renovations. Contractor – Hiring a contractor might be one of the best ideas you can make when doing a whole-house renovation. Contractors like Fleming Construction in Des Moines can help make the whole process simple and stress-free. Not only will they be able to tell you what will work or not work with your current home, they’ll provide suggestions for design, style, and the most current technologies in home improvement that you may not have considered. They are also invaluable when it comes to hiring sub-contractors such as plumbers, electricians, and carpenters who specialize in different areas of the home. Here are some pointers from the National Association of home builders on How to find a contractor in Des Moines. Look to the future – Even if you are not planning to remodel the whole house at once it is important to plan ahead to future phases. This is especially relevant if these future phases will need duct work, plumbing, or electrical changes. Even something as small as a misplace light or electrical outlet could cause problems for later renovations. Another future aspect to consider is how will you utilize your home as you grow older. While it might be nice to have a low-rise toilet for your toddler now, how will this be used once your kids are teenagers? Your teens might like a customized video game room, but will this space be appropriate once they move out? Whatever customizing or personal design work you plan now, make sure it will last through the next 20-30 years and not just fit your family’s current needs. Now that you have a plan in place it is time to begin the anticipated remodeling project. Below are some of the main steps that are involved in a whole-house renovation. Of course some of these steps may not apply to your specific project, especially if you have chosen to do a simple remodel by just updating the floors, refreshing the paint or installing new kitchen cabinets. The order of these steps may also vary slightly depending on the contractor you hire and how much of the work he will do himself versus how much will be done by subcontractors. When you hire Fleming Construction you can be assured that each of these steps will be handled with the highest importance and carefulness. We will sit down with you and discuss your concerns as well as use the best quality materials for completion. Demolition – Before the new and improved can be installed, the old needs to be done away with. Demolition can mean different things to different homeowners, but could include everything from pulling up carpet and wallpaper to tearing down walls or cutting a hole in the roof. Some demolition projects can be done in a day or two while others may take much longer. You will want to have a plan in place for staying somewhere else during this process or moving the location of the demolished room to somewhere else in the house. Rebuilding – After the demo is complete it is time to start rebuilding. If walls are being repositioned or added this is the step where wood framing is reassembled along with windows and doors being installed within the framework. For room add-ons, the roof will be added and enclosed along with the gutters and exterior siding. Mechanicals – Once the skeleton of the new rooms has been completed, the utilities can be repositioned to fit the space. This step may also coincide with the rebuilding step if your contractor wants to piece everything together at the same time. Depending on the scope of your project this might be a good time to rewire the entire house especially if you live in an older model. For those who are installing new appliances or find they will be utilizing numerous electronic devices, the electrical panel may need updating as well. Gas and water utilities need to be considered especially if you are remodeling a bathroom and/or a kitchen. Water lines are not as easy to move so your remodeling project may have to be carefully planned around existing pipes. However, this is also a good opportunity to update water supply lines to new copper pipes which are not only more sturdy but allow water to run more quietly. For a remodel that is going to add gas appliances, running new pipes is a must but a larger meter may need to be installed too. During this third step, the duct work for central heating and air conditioning units will also be moved or extended to accommodate your new space. Walls – After all of the behind the scenes work is done it is time to start enclosing the walls. Insulation will be inserted or blown in first. Dry wall will be hung next along with taping, mudding, and sanding. Once the walls are smooth they are ready for paint, wall paper, or whatever finish you chose during your planning stages. Flooring – While some contractors choose to install the flooring after the walls have been painted and finished in order to avoid damage to the floors, others could recommend flooring first. This will be discussed as part of your overall plan. Any needed subflooring will likely have been installed during the rebuilding step but now is the time for your personal choice in flooring to bring the room together. Cabinets – This is the step where your personal design choices really start to become noticeable. Any new cabinets for the kitchen or bathroom will be installed during this step. Everything from upper storage cabinets to vanities along with countertops that have been pre-cut with spaces to accommodate sinks and appliances. This step will probably be skipped if you only remodeled the bedrooms or living room. Appliances – Your new space is now ready to become functional. Any new appliances you fit into your plan and budget will be installed. Everything from the refrigerator to the stove, sinks and tubs with their stylish faucets and fixtures, as well as the washer and dryer. Even if you chose to keep your previous appliances they will be introduced to their new locations. Final touches – Before clean-up can begin all of the finishing touches will be applied. Touch-ups to paint will be completed along with any wallpaper that needed to wait until floors were done. Those personal touches like the customized backsplash and light fixtures will be installed. Along with door and window trim, hooks, shelving, and hardware. If you aren’t a person with an eye for decorating, this is the step in which an interior decorator can help make your personal style a reality. There are a lot of steps and a great deal of planning that goes into whole-house remodeling and renovation. Whether you’re doing just a few updates or gutting the entire space to rebuild from the ground up, a contractor like Fleming Construction can help complete each of the required steps to make your dream space a reality. Owner, Zak Fleming, and our team of professionals will sit down and discuss all of your ideas, expectations, and your budget. We offer a unique vision and a hands-on approach to whole-house remodels that will help your project run smoothly and quickly to bring you the space and home of your dreams. Contact Zak and Fleming Construction by visiting our website www.flemingconstructionllc.com or giving us a call today at 515-202-1244. Our Whole-Home portfolio will give you a chance to view the quality of our work and maybe even inspire some ideas of your own. Also check us out on Facebook and Houzz.